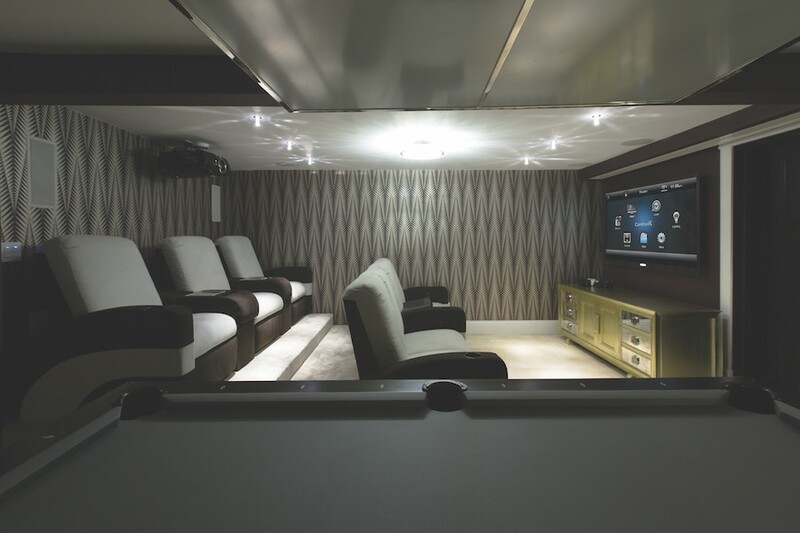 The home automation business started years ago looking to simplify the complexity of audio-video systems. If you are starting a movie, you may have a lot of moving parts to synchronize. There is the projector or display to turn on and have the right input. There’s the sound system that must do the same. If you happen to have a more complex setup like separate amps and audio processors, they both need to come on in the right sequence. What if you have a motor that lowers the projector screen? There’s another step. We are just addressing the audio-video system so far. If your room has windows – as in a multipurpose media room – you want to control ambient light, especially with a projector. If it’s nighttime, perhaps it won’t matter. But maybe you have drapes that can be drawn over the windows, and those drapes help with sound reflection for movies. Then there is lighting. You might want near total darkness for a film, but a different dimming for watching a sports game. In some cases, people might be seated for a dedicated movie session, but standing or moving around during a game. The more you can easily control the environment depending on the entertainment, the more time you will spend having fun and not fiddling with getting things right. That’s where Control4 automation can step in and take control. With one button press – or a voice command – you can have movie night cued up. The screen lowers, the lights dim just so, the amp is set to the right input, format, and volume, the automated shades or drapes close, and even your thermostat can adjust to the perfect temperature. If it’s Monday night football night, several of those settings might be different. Either way, it’s automated – that’s the luxury of Control4 smart automation. Control4 doesn’t force you into one mode of control for your room or home. Do you like pressing real buttons? The scenes we described could be triggered by a wall-mounted keypad or the press of a button on Control4’s customizable AV remote. Or you could do it via a dedicated Control4 touchscreen on your wall or tabletop, or the Control4 app on your phone. Of course, because of Control4 integration with Amazon Alexa and Google Assistant, you can use your voice as well – so you really have all the options. There’s more to Control4 that goes beyond the theater. If someone rings your doorbell, the system can automatically pause the movie bring up the lights so you can see who it is. If you have the Control4 Door Station, you can even see who it is and talk to them without getting up from your seat. And if it happens to be a friend you were expecting and you have smart locks, you can press a button and let them in to join the fun. Let Encore Sight and Sound elevate your home theater and entertainment experience in Fort Collins with Control4 automation. To learn more, reach out to one of our experts at 970-217-7018, fill out our online form, or send a message in the live chat window at the bottom of your screen.